Petrotechnical Data Systems (PDS) has announced the commercial availability of Ava® Clastics analogue database and clastic sedimentology software. Ava Clastics, available under a subscription licence, applies the latest data and ideas from leading academic research to clastics reservoir modelling, optimizing the transformation of geological analogues into parameters for facies modelling algorithms. Ava Clastics is the first of a portfolio of geoscience software-as-a-service (SaaS) products developed by PDS for a bimonthly release cycle. The scalability and flexibility of Microsoft® Azure’s cloud platform will enable PDS to provide Ava Clastics subscribers with continuous improvements in the form of new workflows and analogue data sources. 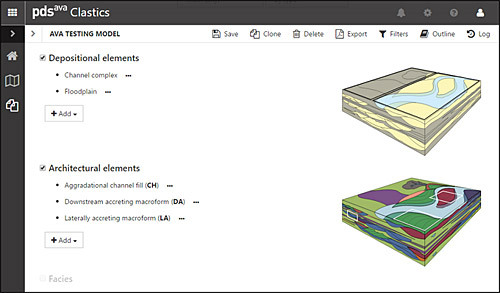 Designed for geologists by geologists, Ava Clastics’ intuitive workflow helps subscribers browse and select data from geological analogue databases, and transforms results into parameters used by facies modelling algorithms. It is widely considered best practice to use analogue data in facies models. However, the process is time consuming, somewhat subjective, and highly variable depending on domain expertise. By using GeoCypher™ logic, a proprietary technology jointly developed with the University of Leeds, Ava Clastics helps geoscientists consistently combine well data with quantitative analogue data in a reservoir model, and delivers an audit trail so insights are preserved for later use. GeoCypher replaces the current ad-hoc workflow for analogue supported facies modelling with systematic parameterisation, and ensures transparency in how analogue data is used and incorporated in modelling. The flexible design of the software enables use of proprietary or public analogue databases. The initial release of Ava Clastics provides users with exclusive access to the commercial version of a world-class relational database of high-quality outcrop analogues created by the University of Leeds, known as the Fluvial Architecture Knowledge Transfer System (FAKTS). FAKTS is an elite feature of the Ava Clastics experience and represents the first results of the partnership agreement signed in mid-2016 between PDS and the university. Subscribers will benefit from FAKTS’ hard and soft data about fluvial sedimentary architecture derived from original fieldwork studies and from peer-reviewed literature syntheses, and can anticipate ongoing research contributions from the University of Leeds. “The beauty of Ava Clastics is that it represents the collaborative efforts of research institutes working together with industry experts to deliver the technology needed for today’s complex and competitive business environment,” says Steve Daum, Group Managing Director of Petrotechnical Data Systems.